I am relying a lot of this off one of my favorite story lines, Secret Origin. We begin where we have before, a young Hal waving to his father as he gets into his plane. Watching his father fly, seeing him lose control, only to steer the plane away from the crowd to save countless people before he dies. We have Hal speak over these scenes saying that is the last time he let fear overtake him, that he wants to be like his father and even in the face of death overcome fear and do what it takes to do the right thing. We then show Hal joining the Air Force even though his mother is against it and we see Hal taking risks whenever he flies. We then cut to the planet Ysmault and Green Lantern Abin Sur is talking to the Five Inversions trying to find out about the “Blackest Night.” This is a prophesy Abin had heard and it has consumed him. He no longer trusts his ring, and feels fear. He uses a ship to fly even though he does not need it with the right. As he flies away from the planet, with a captive Atrocitus locked away. He contacts his friend and fellow corps member Sinestro that Earth is the birthplace of the Black. Sinestro tells him that the Inversions instilled fear in him, but Sinestro would assist him if needed even though the Guardians forbid Lanterns to enter other sectors of the universe. Back on Earth, Hal Jordan is getting yelled at for being reckless with the plane again and is going to be “grounded” if he keeps it up. Carol Ferris, whose father owns the base tells Hal he needs to be careful and listen to his superiors, he asks her where they want to eat on their date tonight. Now wearing a badgeless Green Lantern costume, Hal flies off and saves a bus from falling off the side of the cliff. 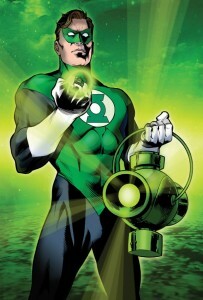 People snap pictures and he says he is just doing his duty as Green Lantern. Realizing he will now be a hero and that the government are probably on their way to the crash site, Hal flies back to give Abin a proper burial. Then the ring tells him he must report to Oa for training. When Hal arrives Kilowog is waiting and training begins, where he learns about the yellow impurity (The ring won’t work against the color yellow). Hal finally earns his badge and goes back to earth to continuing in the air force as well as being a new superhero. Sinestro is then caught off guard when a guardian calling himself Ganthet asks Sinestro to go to Earth to look into Abin’s death and to help his replacement. Sinestro did not trust Ganthet at first but decides to go anyways breaking the sector rule. Sinestro arrives and confronts Jordan. He destroys Hal’s constructs with ease and begins to mentor Hal, this sets off the message in Hal’s ring for Sinestro. Abin tells him that space sector 666 was destroyed by the Manhunters robots who came before the Green Lantern corps and turned on the guardians. He learns of the 5 Inversions and realizes that Atrocitus is on Earth. We see a young man who works at a morgue named William Hand. when Atrocitus comes in and says that he is key to the Blackest Night. When Hal and Sinesto arrive, Atrocitus uses a weapon that drains them of their Rings energy. With their rings out of power, they still battle because Sinestro has his lantern stored in the pocket dimension. 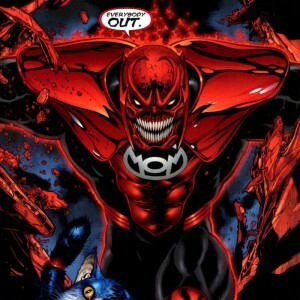 As the battle continues, we learn that Atrocitus was from sector 666 and is the only surviving member living for thousands of years full of hate and rage toward the guardians. He then gets the upper hand and is about to crush Sinestro with a yellow truck when Hal uses a jet shaped construct to destroy the truck, to Sinestro’s amazement Hal is the first lantern to overcome the Yellow impurity. Sinestro arrests Atrocitus, not noticing William had taken the weapon that stole their power. Sinestro will not admit that Hal overcame the yellow impurity. The guardians are upset that Sinestro went into Hal sector but realize the power of teamwork, they tell Sinestro that he must continue helping Jordan, Sinestro agrees and tells Jordan the next time they work together it will be on his planet Korugar so Jordan can see why Sinestro is the greatest Green Lantern, his planet and sector is in complete order. Jordan tries to prove he beat the yellow to Sinestro and tries to blast a yellow statue but fails. Sinestro leaves to take Atrocitus back to Ysmault. We see William Hand break into a hospital and touch a dead body when a security guard catches him, William uses the weapon that shoots green light out and kills the guard, and William says Death is good. On Ysmault, Atrocitus tells Sinestro that he sees that Korugar will soon begin a civil war, and it is something Sinestro will not be able to control. Sinestro tells him that Korugar will never be like that as long as He is there to instill order. Atrocitus says, “you mean as long as your there to instill fear.” We see Atrocitus’ eyes show the symbol of the Red Lantern as Sinestro says “No.” and his eyes have the symbol of the Sinestro corps. The guardians decide each sector needs to have two lanterns patrolling, as well as Oa needs an Honor Guard, and the guardians say Hal will no longer be the only Earthman. I have been without internet for a few days, so I should have my Justice League movie posted in a few days. Let me know your thoughts below, or on twitter (@joshraj9).